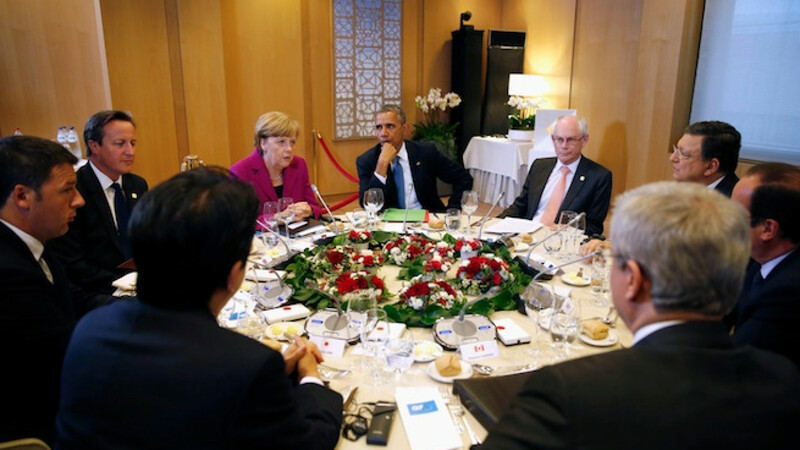 U.S. President Barack Obama and other leaders attend a working dinner at the G7 Summit in Brussels. The world's leading industrialized nations have threatened to impose harder-hitting sanctions on Russia if it does not help restore stability to eastern Ukraine, where pro-Russian militias continue to operate at will. While Ukraine was able to hold a largely peaceful presidential election last month, the situation in the east near the Russian border remains volatile, with armed groups attacking Ukrainian government forces and occupying state buildings. "We stand ready to intensify targeted sanctions and to consider significant additional restrictive measures to impose further costs on Russia should events so require," the Group of Seven said Wednesday in a statement after evening talks in Brussels. German Chancellor Angela Merkel said Western powers would check "again and again" to verify that Russia was doing what it could to stabilize the situation, which erupted in March after Russia seized Crimea from Ukraine and annexed it. "We cannot afford a further destabilization in Ukraine," Merkel told reporters. "If we do not have progress in the questions we have to solve there is the possibility of sanctions, even heavy sanctions of phase 3 on the table," she said, referring to restrictions on trade, finance and energy. So far, the U.S. and European Union have imposed relatively minor travel bans and asset freezes on dozens of Russian officials in reaction to the seizure of Crimea. Further steps were threatened if the May 25 elections were affected. However, they went smoothly and new President Petro Poroshenko will be sworn in on Saturday. Some saw that as an indication that Russia was being more cooperative, reducing the threat of further sanctions. But Wednesday's statement suggests the West is not yet satisfied that Russian President Vladimir Putin is doing enough to calm the situation. While Putin has been cut out of the G7 — the meeting is the first without Russia since it joined the club in 1997 — he will hold face-to-face meetings with Merkel, French President Francois Hollande and Britain's David Cameron at a D-Day anniversary gathering in France later this week. As well as foreign policy, the two-day G7 summit will cover economics, trade, climate and energy policy. One of the most sensitive discussions will be over energy security, particularly in Europe, which relies on Russia for about a third of its oil and gas — a fact that gives Moscow leverage over the EU and its 500 million people. European leaders have committed themselves to diversifying away from Russia but doing so will take time and be costly, and may in part depend on the willingness of the U.S. to supply liquified natural gas to Europe. A separate communique will be released by the G7 leaders after talks on Thursday which will highlight the need to prioritize security of energy supplies. "The use of energy supplies as a means of political coercion or as a threat to security is unacceptable," a draft of that statement said. "The crisis in Ukraine makes plain that energy security must be at the centre of our collective agenda and requires a step-change to our approach to diversifying energy supplies."